In the state personal income tax area, perhaps no subject is less understood than the concept of “domicile,” or what is commonly referred to as a taxpayer’s “home state.” A person can have many residences, but in a tax sense, an individual can only have one domicile. A taxpayer’s domicile is the place they intend to be their permanent home. One of the more confusing aspects of determining where a person’s domicile is located is that in seeking an answer to the question, state taxing authorities claim to look to an individual’s subjective intent, but in so doing evaluate objective criteria to reach a conclusion. To the various states, ascertaining where a taxpayer is domiciled is of major importance, since generally taxpayers are subject to tax on 100 percent of their worldwide income by their home state (subject to certain credits and exceptions). Although each state may have its own quirks regarding the domicile question, most are somewhat similar in nature with respect to the issue. New York has a well-established framework for addressing the domicile issue, and thus provides us with some very clear guidelines regarding how state auditors attempt to reach a conclusion when examining taxpayers who are facing a residency audit. A taxpayer undergoing a residency audit in New York carries the burden of proving a change in domicile by what is termed “clear and convincing evidence.” It is important to note, that in situations where a taxpayer has multiple residences located in New York and another state, upon audit by the New York State Department of Taxation and Finance (the “Department”), the auditor will first try to determine the location of the individual’s domicile, before moving on to possible “statutory residency” question (the greater than 183 days rule). If they are successful concerning their efforts to retain the taxpayer as a New York domiciliary, there is no reason to push hard on the statutory residency analysis although they will look at it. 1. Home: It is likely that the first primary factor an auditor will address with a taxpayer is the homes they maintained during the audit period. They will try to determine how the New York homes were maintained and used when contrasted to the use and maintenance of the non-New York homes. They will compare the size and value of each residence. For example, a taxpayer arguing that they are domiciled in Florida when their home in that state consists of a $500,000 two bedroom condominium versus a $1.5 million home in New York is not likely to carry the day regarding the home factor. An auditor will question a taxpayer about the patterns of usage regarding the respective homes. Is the usage of one home more “seasonal” than the other? Often considered is whether the taxpayer’s home is his or her “historical” New York home or does it represent a new purchase that is significantly smaller than their previous one. If one of the homes is rented, as opposed to owned, the length of the lease is often considered by an auditor when examining the home factor. Obviously, a long-term lease is more demonstrative of a taxpayer’s intent than a short-term one. 2. Active Business Involvement: An individual’s continued employment in New York, or continued active participation in a New York business, is another important primary factor that an auditor evaluates in determining domicile. In analyzing active involvement in a New York business, an auditor will consider the amount of involvement in the New York business in comparison to any involvement in businesses located outside of the state. Further, a taxpayer can be considered to be actively involved in a New York business even though they are not physically present in the state. 3. Time: The amount of time a taxpayer spends in New York versus the amount of time spent in other locations is also part of the analysis carried on by the Department’s auditors during the course of an audit. A taxpayer claiming a change of domicile who spends eight months in New York and four months in Florida demonstrates a fact pattern that really doesn’t support the change. Although the time factor is not determinative of itself, it certainly is an important part of the domicile equation. 4. Items “Near and Dear:” Almost every taxpayer has certain items that they hold “close to their heart.” These could be family heirlooms, photographs, art work, jewelry, coin or stamp collections, etc. Upon audit, the auditor will seek to determine the location of such items, and contrast the amount and value of such items located in New York as opposed to the amount and value of the items located outside of the state. Of course, as part of the analysis, an auditor is expected to recognize that “sentimental value” sometimes has little relationship to actual monetary value. This particular factor tends to be very personal in nature. 5. Family Connections: The Department views an analysis of family connections as a vital cog in evaluating a domicile question. The feeling being that a taxpayer is generally domiciled where their family is located. For purposes of the Department’s analysis, a taxpayer’s “family” typically consists of the taxpayer, a spouse or life partner, and any minor children. There is precedent in New York case law for finding that spouses can have different domiciles, but it is somewhat unusual. Further, there have been situations where aging parents or adult children have been considered to be family members for purposes of the domicile analysis, but that too is not the norm. As indicated above, the Department views the Primary Factors as the critical part of any domicile inquiry. Only if an auditor cannot reach a decision after analyzing those factors, which is unusual, will they look to certain other factors. Those include some of the more commonly known criteria such as the location of where a taxpayer is registered to vote, the location of car and boat registrations, the location of the taxpayer’s driver’s license, as well as any citation of an address in legal documents regarding an individual’s domicile (home state). 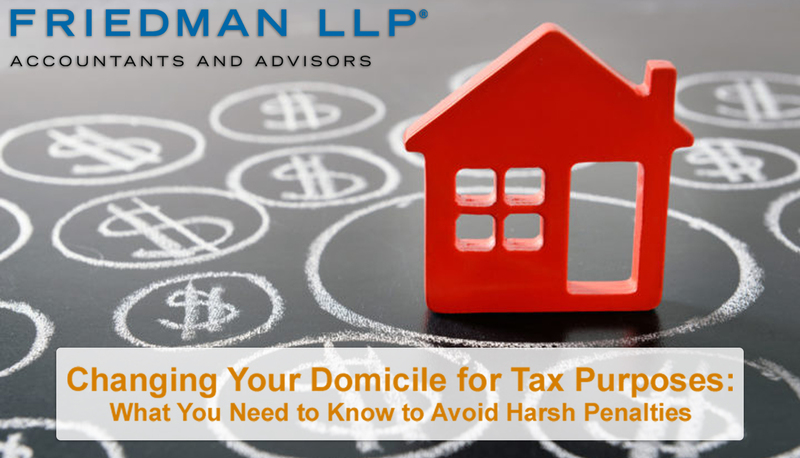 A determination of a taxpayer’s domicile is a critical component of any state income tax audit where a purported change of domicile is claimed by the taxpayer. It is crucial that a taxpayer being subjected to such an audit understand that they have the burden of proving the change. The state taxing authorities do not have to disprove it! Contact your Friedman advisor for tax guidance pertaining to your unique situation. Changing your domicile for tax purposes? Register for our upcoming webinar on February 27 to learn how you can avoid harsh penalties.